During the 2001 Legislative session, the Utah State Legislature eliminated funding for all public art projects for the fiscal year 2002, terminating a public program that has benefited the community for over fifteen years. This means that citizens of the State of Utah from all walks of life and every part of the State will not have the opportunity to experience art in public spaces for the new or remodeled State buildings that were approved for construction this year. Buildings like the new center for the Shakespearean Festival, the Museum of Natural History and the performing arts center at Snow College, among others, did not receive funding for public art projects. Communities have lost an opportunity to bring in artists from all over Utah and the United States to create art specifically for them and the institution or agency that serve them. The Public Art Program and the Utah Arts Council mourn the loss of this opportunity to help build the communities of Utah economically, educationally and culturally. The cultural loss is incalculable. The loss to artists and small business is enormous. The loss to community efforts in establishing a sense of place and pride could never be measured. It is known that businesses looking to locate in a new community often look for the visible commitment to culture and pride of place that public art demonstrates. Public Art is the very embodiment of art for everyone. It is a direct contradiction to accusations of elitism so often cited by opponents to the public funding of art. Since the inception of Utah’s Public Art Program by the Utah State Legislature in 1985, over 200 artworks have been installed in 63 sites throughout Utah. Our public art collection has a wide variety of media from stone gardens, benches and fountains to 19’ paintings depicting the majesty of Utah’s landscape. All of these works are in, on, or around the state buildings they were commissioned for from St. George to Logan. The process of commissioning public art is for and by the community. Every project has a unique committee. The architect, the Division of Facilities Construction and Management, the Utah Arts Council, and the state agency being housed in the facility and the community are all represented. The committee reviews every artist’s proposal and awards the commission based on the aesthetic value, qualifications of the artist and how appropriate the proposal is for the agency and the community. This process insures the art is not “plopped” into a community but is created specifically for and with sensitivity to the community’s history, culture and people. The Utah State Legislature’s Capital Facilities and Administrative Services Committee is the body through which all funding for State facilities is approved or denied. This committee will be revisiting the issue of funding public artwork in the next legislative session. Please join us in contacting your legislative representatives to explain the importance of art in public spaces for your community. If you have any questions about Utah’s Public Art Program or would like some literature about the program please call or email Jim Glenn at 801-533-3585 or jglenn@ucc.state.ut.us or Fletcher Booth at 801-533-3586 or fbooth@ucc.state.ut.us. The Utah Arts Council web site at www.arts.utah.org can give you more information about all of the programs offered through the Utah Arts Council. The Public Art “Commissions” page lists public art calls for entries from both regional and national projects. 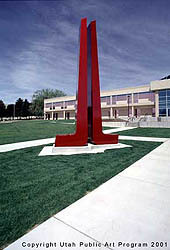 “Ascent Totem” 1991 (Painted aluminum 25′ x 12′ x 4′) located at the College of Eastern Utah, Price UT. Images copyright Utah Arts Council. We believe we have benefited greatly from the Public Art Program. Our campus has several sculptures as a result of the program that add beauty and interest to the campus. We bring visitors to our campus whenever possible. I’m sure that some individuals are surprised to see art at a technical school – but art enhances the soul regardless of your career choice. The comments we receive from the public are very positive, especially with regard to the most recent sculpture. It is truly quite impressive. I found the process to be fair and appropriate. The staff were great – gave us a lot of support and unbiased input, and did not try to influence the process. We had significant community input but appreciated that we also had a somewhat greater say in what was selected, for after all the sculptures are located on our campus – we look at them every day. I am truly sorry that funding has been cut. I understand the economic realities – when times are tight, we need to preserve the basics. It is unfortunate that some of the first items to go are those that elevate the human spirit – and in these recent times, we sorely are in need of that. 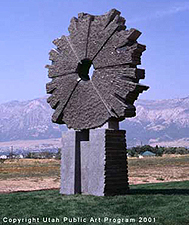 When, in February 2001, the Utah Legislature’s Executive Appropriations Committee proposed to eliminate funding for art in public buildings, Representative Ralph Becker attempted to save the Public Art Program by amending the bill to allow interest earnings from tax funds for construction projects to pay for the one percent for arts program. After committee discussion, however, Rep. Becker’s motion was withdrawn. Representative Becker sent 15 BYTES the following in regards to the upcoming 2002 Legislative session:“Art deserves support from our State Legislature, and should be viewed as an essential part of our state buildings. Public art creates an atmosphere, heritage, enjoyment, and sense of place. Public art creates a lasting statement that we, in Utah, value art as an integral part of our community. We also provide support for artists in Utah. The art element in our State buildings should not be viewed as extraneous. In the 2001 Legislative Session, the 1% for the arts was eliminated in many state buildings. I objected to the elimination, and tried unsuccessfully to restore the cuts. I believe we were creating a terrible precedent that I hope won’t be repeated. 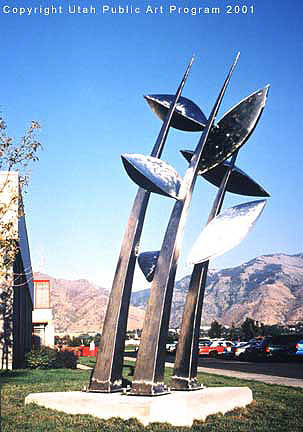 “Untitled Trees” by Kenny Davis appears in the Ogden Courthouse courtesy of the Utah Public Art Program. 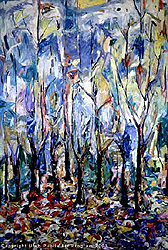 The work was done in 1995, measures 12′ x 8′ and is oil on canvas. Copyright Utah Arts Council. In Ogden we believe that public art adds value to the community, so five years ago we passed our own Percent for Art Ordinance to launch our local program. The State Percent for Art Program has also provided art pieces that enhance the State owned buildings in our community, notably the Courts Buildings, the School for the Deaf and Blind, and Weber State University. Donations of additional sculptural pieces have resulted from the stimulation of our Public Art Programs. I strongly support the reinstatement of the State’s Program to apply 1% of a building’s cost for art in public buildings. This program has made a tremendously positive impact on the visual aesthetic in communities all across the State. I was fortunate to be invited to join the Selection Committee for the piece installed recently at the Ogden-Weber Applied Technology College. The process worked very well with an introductory pre-proposal meeting, a meeting to review 15 written proposals and select semifinalists, and a final meeting to select the finalist from 3 who presented models with more specifically designed proposals. The Selection Committee was made up of client representatives and arts professionals from the community, and each participated thoughtfully throughout the process. Jim Glenn and Fletcher Booth from the Utah Arts Council’s staff prepared informative documents and agendas for each meeting. After careful consideration, the Committee recommended that Robert Sindorf create his, “Dance of Creation” for the site, just to the north of the Manufacturing Technologies Building. Mr. Sindorf is an architect who fully understood the appropriate scale for this piece and who used tooling techniques in creating this work that reflected activities in this training facility. It is a visually stunning addition to the inventory of public art in Ogden. The selection of this work adds variety that further enables our citizens and visitors to understand and appreciate art. Those in the community, especially at the ATC, have really embraced this work and are thrilled to have it installed in Ogden.